While there is not a large number of treatments for patients with polycythemia vera (PV), there are currently regimens in the first- and second-line setting that work well for this population, says Jeanne M. Palmer, MD. For example, long-term follow-up data from the phase III RESPONSE study showed that patients who responded to the JAK2 inhibitor ruxolitinib (Jakafi) as a second-line treatment maintained those responses for up to 4 years. At 208 weeks, 41 patients (37%) originally on the ruxolitinib arm remained on treatment compared with no patients on the control arm. Additionally, 70% of patients who had clinicohematologic (CLHM) response maintained that status. There were no new safety signals compared with the previous follow-up at 80 weeks. 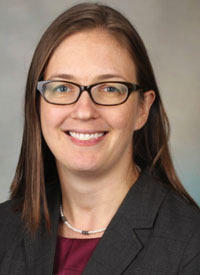 In an interview during the 2018 OncLive® State of the Science SummitTM on Multiple Myeloma, Palmer, an oncologist in the Bone Marrow Transplant Program at Mayo Clinic, discussed the current treatment landscape for patients with PV and highlighted the impact that ruxolitinib has had on the second-line treatment setting. OncLive®: Please provide an overview of your presentation on PV. Palmer: I reviewed the treatment for PV and discussed the diagnosis, different prognostic features, as well as the goals of care and treatment. I covered first-line treatment, which includes either phlebotomy, hydroxyurea, or interferon. The second-line therapy is usually ruxolitinib. What are some of the biggest challenges in diagnosing patients with PV? One of the biggest challenges is since the hemoglobin parameters have been lowered, many patients who have met the hemoglobin criteria do not have the JAK2 mutation and the bone marrow biopsy is nonspecific. That is a challenging factor. If they have a JAK2 mutation and a high hemoglobin, then it is a “slam dunk.” However, if they do not and they have the erythrocytosis, it raises the question of whether there is another diagnosis that we are missing. It is possible they could have JAK2-negative PV. What are we looking for when a patient presents with PV-like symptoms? We are primarily looking for elevated hemoglobin. You want to see it in the absence of having another reason for it, such as chronic hypoxia, chronic lung disease, or testosterone use. We also look to see if the patient is JAK2 positive. Are there any other types of molecular abnormalities other than JAK2 that we are in the process of identifying? We mostly look for JAK2 mutations. It is either JAK2 or JAK exon 12; there are also some other mutations that can occur in the JAK protein. In other myeloproliferative diseases, we look for calreticulin mutations and MPL mutations, but those are not often seen in PV. Finally, we can gather mutation information with next-generation sequencing, which is a way to do a broad overview of mutations that can occur with any myeloid malignancy. The panels run anywhere from a 29-gene panel to a 100-gene panel. There are a few that have been found to potentially carry prognostic value in PV. Can you discuss ruxolitinib and how that agent has had an impact on the treatment landscape? Many patients with PV are extremely symptomatic, but the symptom control is good with ruxolitinib. That is a good treatment and the best option when you can use it. Also, if you look at the other therapies, phlebotomy and hydroxyurea have their drawbacks. With hydroxyurea, there are many concerns in the myeloproliferative neoplasm community about its risk for leukemia—even though that has never been validated. Finally, pegylated interferon is another excellent choice to treat patients, but it is not well tolerated. Hopefully that will be changing with some of the newer formulations of pegylated interferon; currently it is very difficult to tolerate. It is nice to have ruxolitinib as a potential therapeutic option. What is the typical amount of time that a patient can undergo phlebotomy before they relapse? None of these treatments fix this disease. All of them are primarily designed to reduce the hemoglobin. If you maintain it at a low enough level then you reduce the risk of cardiovascular events, but we also know that by controlling the hemoglobin adequately we can also control the symptom profile very well.